Perhaps it would be easy to suggest she sounds good for her age, but 19-year-old singer/songwriter Lindsey Mae possesses the sort of talent that’s remarkable by any standard. On her self-titled, debut EP, she draws upon folk and pop in songs as engaging as they are well-written, singing them in a voice that is at turns winsome and impressionably coy. She wraps acoustic-laden arrangements around picturesque metaphors and imagery, imparting the nervous rush of infatuation with moments of self-consciousness and awkward uncertainty that inevitably come along with it. Throughout the EP’s five tracks—which were produced by Hal Cragin (A Fine Frenzy)—Lindsey Mae demonstrates genuine empathy and sophistication, two qualities which will serve her well as she continues to develop her creativity. As unaffected and sincere in her demeanor as she is in her music, Lindsey Mae graciously took some time to speak about her craft and ambition. On the biography you wrote on your Myspace page, you say that you find writing fascinating. A lot of songwriters actually dread it. They like having written a song, but they don’t particularly enjoy the process. What about songwriting fascinates you? For me, I’ve always been the kind of person to use writing as a way to speak. Most people who meet me say that I’m a very shy and reserved person. So my way of expressing how I feel is through writing. And it’s always fascinating to me because it’s amazing what comes out [on] paper that sometimes you just can’t say to people. And music’s my way of sneaking out things that I really want to say but I really can’t say. I turn all my poetry and all my writing into my songs. What do you find as the most challenging aspect of songwriting? I definitely find coming up with new chord progressions [on the guitar] the hardest part. My dad played bass guitar, so he taught me a few basics, but other than that I was pretty much on my own. I’ve kind of been coaching myself. You have a real affinity for melody. Do the melodies just come to you or does it take a great deal of effort to work them out? Usually, they just come to me. For example, there was a day last week [when] I was just getting on the subway and I just started humming this melody. And I just pulled out my phone and recorded it. I came back and wrote a song. How are you enjoying playing live? Oh, I love it. That’s the best part of it. When some of my friends come out—and they’re so cute—they’ll sit up really close and they’ll sing all the songs. It’s an awesome feeling, especially meeting people. One person had traveled over an hour to get to a show I played in Philadelphia once. And she absolutely loved it. She was like, “I’m one of your biggest fans!” It just made my day. It’s the best feeling ever. I’ve always had stage fright, ironically, but I kind of get the feeling, like, I’m in my bedroom just practicing, but for a bunch of people. I always get that little butterfly, tingly feeling, but for me, that’s the reason why I do it—because it feels good. In working with Hal Cragin, what has he brought to your music? How has he helped shape it? Once people get to know me, I’m not that shy and reserved. He brings out the liveliness of my personality in the music... [He] literally puts who I am in music form. And I love it. How do you see yourself as an artist evolving in the future? I’m just going to do it one fan at a time... We’ve gone on three different tours this past year. This [coming] year, I’m going to try to do that again. We just played smaller venues all around the Northeast. One by one, we started building a little fanbase. To me, that’s fun. My favorite song on the EP is “Paper Mache.” Is there a story behind that? A lot of those songs—“Paper Mache,” “Time,” and “The Way You”—were all about dreams that I’ve had. A lot of the songs that I write are just about daydreams where I imagine this little romantic situation or what I feel about love or whatever. There’s always a certain situation with a guy without a face. So I’m just writing about hope for love that I’m dreaming of. 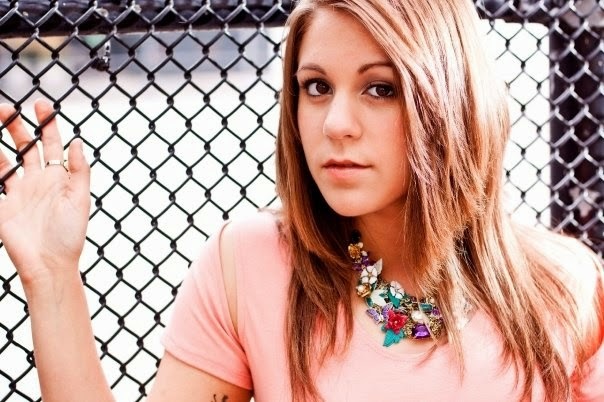 Check out Lindsey Mae's Myspace page for more information on her music and live dates. She is currently at work on her first full-length album, which is due out next year.